Are you looking for a job in Kolkata airport? it’s maybe ground staff or cabin crew jobs. Then you are in the right place to get information about the airline’s jobs in Kolkata. Here you will get the knowledge to apply online or offline process for Bhadra Aviation and some other airlines at Kolkata airport. So, if you are interested to work in dumdum airport ground staff job Kolkata, please read this article till the end. 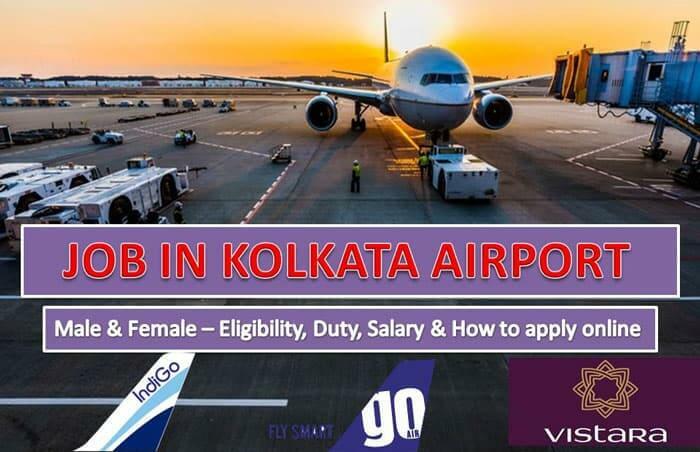 Here you will get the full information for a career at Kolkata airport. Like how to apply for this company? and the position they are hired for and eligibility criteria for all those jobs and jobs descriptions. So, it’s my request to all please don’t pay anyone for Job at Kolkata airport. Because now a days in Kolkata there is much fake agency’s, They are advertising for ground staff and cabin crew jobs. When you will apply for that job they will asking for money. So, friend’s please keep it on your mind that airlines or ground handling company never asking for money from anyone for the jobs and interview. So, allows following the company official website to apply online for cabin crew jobs or ground staff jobs. Bhadra International India Pvt. Ltd. is India based ground handling company. Which provides premium ground handling services. Bhadra gave security clearance to provide ground handling services in 7 major international airports in the first 20 major airports of India. Bhadra is allowed to do extensive Land Handling Services in 2 Like Chennai and Kolkata in metropolitan cities in India. And all the airports in the southern region such as Coimbatore, Trichy, Mangalore, Trivandrum, Calicut. The chairman and MD of the company are Mr. Prem Bajaj and the Board of Directors is Mr. Hiyav Bajaj. Click here to visite company official website. Freind’s if you are interested to apply for Bhadra international career. There has some limited option for boys and girls because it’s a ground handling company. So, they have some ground staff job vacancy at Kolkata airport and other airports. Please check the below option for an available position in Bhadra. To apply online don’t follow any 3rd party website and any consultancy. to apply online please visit the company official website by click here and send your details to [email protected]. After sending your details you need to wait for 4 to 6 weeks for getting a reply. Most of the time the company makes phone calls everyone for interview information. To apply offline you need to visit the Bhadra international office at the airport and drop your CV or resume. Also, if any of your friend or relative is doing the job at Kolkata airport, you can give your resume or CV to him submit it to airlines office. You can download a free professional resume or CV from here for your ground staff interview. Only female candidate with Indian national can apply for this job. Applicant should have a valid Indian passport. Your age must be between 18 to 27 years. Educational Qualification – You should have cleared your 10+2(H.S) examination, from any recognized Board or University. All Indigo Cabin crew applicant must have the capacitance and clarity of speech in English and Hindi. Your height should be a minimum of 155 cms with proportionate weight, as per BMI. Candidates should have good knowledge of body language and well groomed. No tattoos should be visible when you are in uniform. Now India is one of the largest countries in the World to the growing aviation industry. So, Kolkata airport is one of the major international airports from their list. If you want to work at Kolkata airport then as a ground staff you can get a handsome package from the industry. To apply for any other airlines like Indigo, Spicejet, Goair, Jet Airways, and Vistara, Allows you have to visit their official website and also you can check here the latest ground staff interview for indigo airlines and check here for cabin crew interview of indigo airlines. Here are some interview tips and interview question list for fresher for you which help you to get prepared for ground staff and cabin crew interview. So friend, I think this article will help you get a job in Kolkata airport. From this article, you will get all the information about the ground staff in Kolkata airport. Still, if you have any query related to this article or any about to aviation industry, please feel free to ask me on the below comment box. Also, you can contact me on the Facebook page and youtube channel. Thank you best of luck.